Is that hipped roof right for you? The style of your home will decide. As larger numbers of people choose to bloom where they are planted, so to speak, home additions become increasingly common. Getting it right will take more than just slapping a few boards together, however. If you want that new sunroom, porch or extension to fit right in with the rest of the house, you’ll have to consider the style of the roof’s architecture. You’ll never see a flat roof on an A-frame home. At least, you probably shouldn’t. Certain roofing designs are practically synonymous with particular architectural styles. Get the angle of the roof pitch wrong, and it’s back to the drawing board for you. Flat roof. Modernist architecture often treats the flat roof as additional living space. Mansard roof. Often embellished with dormers, this steeply sloped, four-sided roofing design is a defining feature of the Second Empire style that rose to such popularity in the late 19th century. Mono-pitched roof. Slanted on one side only, these popular roofs work wonderfully with sunrooms and patio extensions. Cross-gabled roof. These intersecting gables appear often on homes of any style whose design features a complex shape and layout. A-frame roof. This roofing style slopes steeply down as far as a home’s foundation. The architectural mode itself gained rapid popularity in the years that followed World War II. Gambrel roof. Although similar in basic shape to a mansard roof, the gambrel often overhangs the facade and lacks a hipped end. Dating back to 16th-century England, it often appears today on Dutch colonial homes. Saltbox roof. 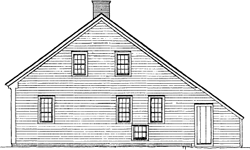 Seen mostly on two- and three-story buildings, these sharply sloped asymmetrical roofs are a defining feature of the early New England colonial style. Hipped roof. This trademark roofline of cottages and bungalows slopes gently and symmetrically down on all sides of a building. Any determination of a proper roof pitch must take into account the weather in your locality. Heavy snow and torrential rain will slide off more quickly if the angles are sufficient to permit it. On the other hand, the steep pitch of a traditional gable roof will increase its square footage and, by extension, your cost to build and repair. If you’ve got questions, Interstate Roofing has the answers. Our expert roofers will be glad to clarify the logistical considerations of constructing and maintaining the roof on your new home or home addition. We even offer a free estimate. Call us at 503-684-5611 today to learn more about our services and to see some of the work we’ve done for fellow northwest homes and businesses.